As people are well aware of the disease-producing effects that tobacco can cause, tobacco detection dogs are welcomed by the general public in many situations. NHS Trusts use Tobacco Detection Dogs to protect vulnerable patients from tobacco made available illicitly in hospitals and clinics. Families and friends of patients have been strong supporters of this initiative. Trading Standards and Police responsible for locating counterfeit and illegal tobacco products have many years experience of the effectiveness of Tobacco Detection Dogs. Bringing proceeds of crime hearings to court after successful detection by trained tobacco detection dogs is always a great outcome. We are happy to support the crackdown on criminal activity and help to put a stop to the illegal sale of tobacco. Criminals that go to great lengths to conceal stores of illegal tobacco products struggle to outwit a tobacco detection dog. Saving time and money during a raid – the dog goes straight to the hiding places. Sometimes these areas of concealment are very sophisticated strong rooms, but they are no match for an expertly trained tobacco detection dog. 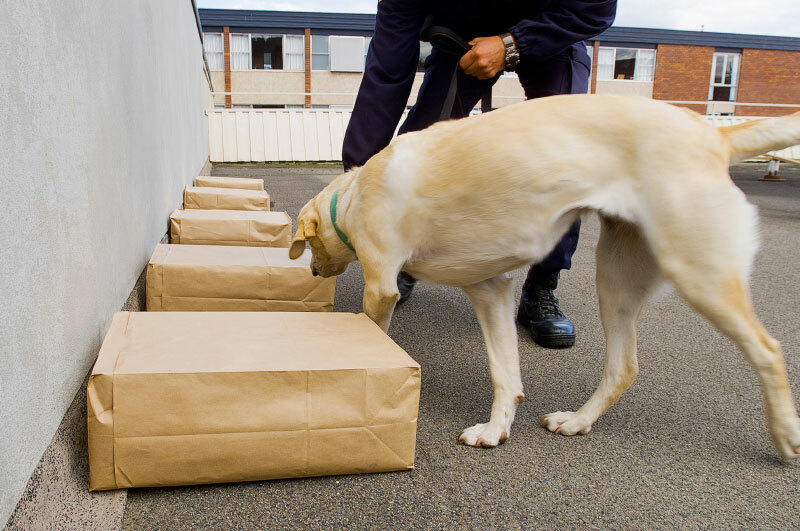 Each dog can be trained to identify a range of both legal and illegal tobacco product strengths. The illicit tobacco market is continuously changing and adapting, but dog trainers can modify training and adjust quickly too. They love a new challenge! Two dogs deployed in an area allows for higher detection rates and lower false positives. The analysis by a small team dogs is a cost-effective method to control illegal tobacco and provides a credible and visible deterrent. Discover more about how we train tobacco detection sniffer dogs. If you would like to speak to our expert handlers, then please contact us.